New month, new issues! And not just your regular set of new issues, but new special issues. Remember the special Women Destroy Science Fiction issue of Lightspeed Magazine from earlier this year? Now women are destroying horror and fantasy (run!). 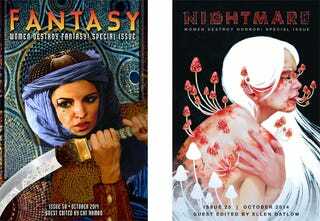 These Women Destroy Fantasy and Women Destroy Horror collections are coming out as special issues of Nightmare and Fantasy Magazines, all made possible by the original Kickstarter. Ellen Datlow and Cat Rambo are the respective editors, so I have no problem recommending you buy both issues even though I'm not done reading them yet. It's hard to go wrong when two great editors (who happen to be women) curate an issue full of fiction (that happens to be all written by women) with the bonus of reprints and non-fiction (again... well, you get the point). The Scrimshaw and the Scream by Kate Hall | Women Destroy Fantasy! The morning after she lost her art, Felicity sat at her speckled mirror, inspecting the glossy, gray-white feathers covering her cheeks and forehead. She grasped one and plucked, winced as the barbed shaft ripped free, a tiny blood-jewel welling up in its place. The scream, living in her chest so long she could almost ignore it, turned a somersault behind her lungs. She swallowed, twirled the feather between thumb and forefinger, watched greasy greens and blues flicker along the white. Not only was she turning into a bird, she was turning into a seagull. A dirty, loud seagull. Hall is an author I've not read before, so I had a bit of concern going on in the middle of the story when a character of color showed up and I wasn't sure if she'd be handled well. In fact, I thought I knew where the story was headed and was prepared to be annoyed by it when, at the very end, the author managed to stick the landing. The ending is what elevates this story from being a straightforward metaphor to something that really resonates. The trouble began a long time before it finished, but it felt like it first started when the westward portage rope snagged on a tree. That wouldn't have been the end of the world—you float your equipment through a forested area, you learn to expect a little snag-and-tag from the landscape. Thing was, the westward portage rope was attached to Billie's harness, and Billie, for all her advantages as a draft animal, is about as smart as damp moss when it comes to things like "noticing external stimuli." She's a genework Indrico there that my Uncle Ren and I bought from a fly-by firm about six years back—a sort of precursor to the rhinoceros, and one of the largest land mammals ever to walk on the planet. When she put down her foot, the ground shook. There were no predators that could take her down and no threats that she recognized as worth giving a damn about, all of which combined to mean that there wasn't much that could distract her from the essential task of eating her way through the foliage of the world. This story took a while for me to warm to since the beginning of it is chock full of worldbuilding details and it takes a while for the plot to arrive in full force. When it does it swept me away pretty hard and by the end I was deeply engaged with McGuire's world. Carnivals and circuses are a thing in genre fiction now—not that I blame anyone for wanting to explore this world from all sorts of angles. Weird carnival, circus of the future, carnival of the apocalypse, a circus that caused the apocalypse. The future world in this story isn't post-apocalyptic but definitely post-something. A sea-change came over the world birthed out of hyper-environmentalism and has changed the way humans conceptualize themselves. The carnival swoops in to offer a taste of the past but is just as much a creature of the modern world as those who've fully succumbed to it. No matter how differently humans conceptualize themselves, they still get caught up in the same relationship patterns. Big Men who are actually small inside and driven by fear and hatred of their own smallness. Loving your big family while simultaneously only wanting to deal with those one or two members of it with whom you actually connect. And taking care of ginormous pre-historic rhinoceros things—like you do. Subscribe to Beneath Ceaseless Skies if you like fantasy and adventure. That was the thing about being a healer. When you didn't have a partner and your knife was shining merrily in the sun on the ground behind the villain, people tended to think you were helpless. "I didn't catch your name," I stalled so pedestrians could clear the area. It'd been a long time since Nevils Borough had suffered a superhero fight and their flight-responses were atrophied. The villain's mouth split in a broader smile, revealing neat rows of perfectly white teeth. "The Crimson Number." "You know that doesn't make any sense, right? The number on your costume is white. Your jumpsuit's red." His posture deflated a little. A superhero story that explores issues of class and race? I am so down with this. Most tales of superheroism show said heroes as wealthy or at least comfortably middle class. And while I'm sure that makes sense for some, the more super-powered people you have around the more likely it is that not all of them will be well-off or never have to struggle in some way beyond supervillainry. Yes, there is a touch of mojo from The Incredibles here, but there's also a touch of every story about superheroes trying to balance and deal with the mundane aspects of their lives. Now that we're at the start of Halloween season (aka the month of October) and I'm all set to read the Women Destroy Horror! issue of Nightmare, I have a small confession to make: I don't read much horror/dark fantasy because I haven't read much that I like. I'm not super into being creeped out. And zombies are not my thing. However, I have read a few really amazing dark stories and I'm willing to give the genre another chance. Any magazines you'd recommend? Any specific dark/horror stories published in the last month or two I missed? Tell me in the comments!